From all the spots I have written about, A Casa is probably the most hidden one I have found. It is in the city center but in a street you will probably never walk along, if you are not going to A Casa of course. 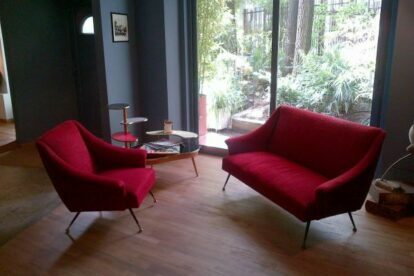 This hidden gem is beautifully decorated in a cool mix of modern and vintage; there are big windows, overlooking the garden, lots of space between the tables (so everyone can mind their own business) and even a cosy library area at the very end where you can chill and enjoy, away from the hustle and bustle of the city. The food is simple Italian with good-quality products from different areas of Italy (same goes for the wine list). Prices are very fair for the quality you will get. Don’t expect a Michelin-star service – instead you will enjoy a very friendly, down-to-earth approach from the youngsters that are not shy to make small talk. Tip – if you don’t know the Italian geography well yet, catch a glimpse at the large map hanging on the wall in the library.